Salt + Bones is an integrated design studio specializing in restaurant, hospitality, and residential interiors, as well as concept and branding development. The name of our studio is a literal derivative of the naturally occurring, universal, and essential mineral, as well as speaks to the structural integrity of the spaces that we design. Just as this mineral is used to enhance flavor, we strive to enhance the aesthetic, quality, and health of the spaces that we design. We believe that design is a holistic process. Every element of the design should connect back and relate to the soul of the concept. We are devoted to working with artisans, craftsmen, and ethical manufacturers with whom our core values align. We believe in the beauty of things imperfect, impermanent and incomplete - a beauty of things unconventional. We place a strong emphasis on creative reuse and working with natural earth-friendly materials. Whether commercial or residential, design is about creating an experience, and telling a story. One cannot always articulate the physical description of a space, but they can always remember the way that it made them feel. We work closely with our clients to understand their story, develop a concept, and bring it to life in physical form. From the rural farmscape of Gilroy to the rugged beauty of Coastal Carmel with stops in Napa and San Francisco, Carissa is the quintessential California designer. Her designs are timeless and crafted with attention to detail, exuding the casual elegance of her home state. She launched SALT + BONES in early 2014 with a focus on boutique hospitality, restaurant and residential design. Carissa moved to the Monterey Peninsula in middle school when her parents decided to buy an ice cream shop near Cannery Row. After earning her BFA in Interior Architecture and Design, she went on to work for an interiors and architecture firm based in Carmel where she focused on high-end residential work, – both local and throughout the US, to include: Carmel, Big Sur, San Francisco, Fort Worth, TX, and Telluride, CO.
Carissa jumpstarted her career as an independent practitioner by designing two restaurants, both located in historic buildings in Monterey - Cannery Row Brewing Company and Restaurant 1833. She worked closely with the owners on concept development, and was responsible for the design of the interiors, exteriors, and signage. She later became Director of Design for Ma(i)sonry Napa Valley, an art, furnishings, and wine collective in Yountville CA. 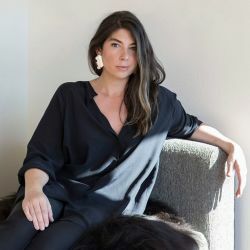 During her tenure there, she was selected to design a room for the 2012 San Francisco Decorator Showcase, and worked closely with the Eames family on multiple design projects, including the design of the entry tent for the 2012 Los Angeles Modernism Show. She returned to Carmel in 2014 and has continued to grow her practice exponentially ever since. She resides in Carmel Valley with Ginger, her beloved miniature schnauzer.